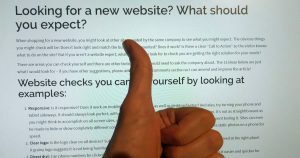 What should you expect from a new website? As well as solving whatever business problem is prompting you to look at a new or changed website, there are several other areas you might want to keep in mind. When shopping for a new website, you might look at other sites created by the same company to see what you might expect. The obvious things you might check will be: Does it look right and match the business represented? Does it work? Is there a clear “Call to Action” so the visitor knows what to do on the site? But if you aren’t a website expert, what else can you look for to check you are getting the right solution for your needs? There are areas you can check yourself and there are other factors that you would need to ask the company about. The 13 ideas below are just what I would look for – if you have other suggestions, please add them in the comments section so I can amend and improve the article! Responsive: Is it responsive? Does it work on mobile phones and tablets as well as desktop/laptop? And also, try turning your phone and tablet sideways. It should always look perfect, with nothing broken or disappearing off the side of the screen. It’s not as straightforward as you might think to accomplish on all screen sizes, so success in this test gives you confidence time has been spent testing it. Sites can even be made to hide or show completely different content on different devices, e.g. full screen video on a laptop vs static photos on a phone for speed. Actually mobile friendly: Everyone does responsive these days, but does it actually make use of the mobile screen properly. Mobiles are portraits, whereas PCs are landscape shaped. So full screen images may lose impact if the same image is used on both formats. Text that appears on an important image on a PC with plenty of room to see the image might totally swamp the image on a mobile, so the ability to move it off the image only on mobile is a great feature. Clear logo: Is the logo clear on all devices? Subconsciously, it’s the first thing a visitor will look at to check they arrived at the right place! A grainy logo suggests it is not being handled properly. Direct dial: Can phone numbers be clicked on a mobile phone so the visitor goes straight to the dialler? It makes it easier and quicker for people to get in touch with you. Result! The same applies with email addresses. But most people don’t have phone options on their PC, so make sure those phone number links can be turned off when browsing on a PC to avoid visitors seeing weird pop-ups when clicked. Hidden or branded login: If there is no requirement for visitors to ever log in (i.e. only admin), can you find the login page? Go to http://[websitename.com]/login Do you see the login area? If so it makes an easier target for hackers. If you can’t find it, you can get a feeling that security is at least being thought about to some level, which is good. And if there IS a requirement for non-admin login, and the normal WordPress login page is being used (rather than a 3rd party login solution), is the page branded, or is the WordPress logo still shown. Social share: What happens when you share the website on facebook? No need to actually add it to your timeline – just paste the domain name in a new Facebook post, maybe pressing space, but not pressing the “post” button. You’ll see the preview (image and text). Does it have a decent large image? Is the image relevant? Is the text succinct and useful? If there is no text, or a small image, or random image, no thought has been put into social sharing, so if social prominence is of interest to you, you might not be shopping in the right place. Load speed: How quickly does the homepage load the very first time you visit. Count it in seconds! There are so many technical factors that affect this, from server speed and location, to site design, but a visitor doesn’t care about any of this. If it hasn’t started showing something on the screen in the first few seconds, they might get bored and try elsewhere. And Google will penalise a slow site in search rankings. If you know how to open a private browsing window / incognito window (check your browser menu), definitely use that when seeing how long a site takes to load, because it pretends you are a new visitor (browsers save bits of sites after the first visit so that return visits are much quicker). Padlock: Do you see the padlock in the address bar and perhaps the word “secure”? Any new site should now come with an SSL certificate so that the padlock is shown for various great reasons. Many hosts are providing one for free, so all you need to do is force the site to use it. All this means is that the data between the visitor and the server is encrypted and cannot be intercepted. It does NOT mean the data stored on the server is secure, so you must still trust a website before entering credit card details or passwords, even if you see the padlock. https://stealallyourdata.themob.net might have a padlock, but you wouldn’t trust it with your data I hope…. Brute Force: Is brute force security in place? If a hacker, be it robot or real, sends invalid requests to the site repeatedly, are they blocked? SEO: Are SEO (Search Engine Optimisation) features easy to set up (and change, should you need to change them yourself)? Google looks for hidden “meta”, as well as what’s visible on the pages, so be sure this area is considered. Social meta: Is social “meta” easy to set up and change? Again, Facebook and Twitter and other social media rely on these hidden items and if they don’t find them, choose things off the page when someone shares your site. Make sure you have control. Access your own site: If you have paid a one-off price, are you provided with an admin user for your own site? And a backup you can easily access in case of need. You might be paying someone else to host the site and make future changes, because you are busy doing activity that brings in money to your business, but what happens if the provider of that service drops off the face of the earth (or gets hit by a meteor)? Be sure you have control should the worst happen, especially if dealing with a small business, otherwise you are left with, at best, a site you cannot change and at worst, no site at all. Own your domain name: Maybe the most important piece of advice when shopping for a site; make sure you own your own domain name! Don’t allow a provider to own it on your behalf. Ideally buy your domain name at a different company from the one providing hosting or management, so you can walk if away should you ever need to.